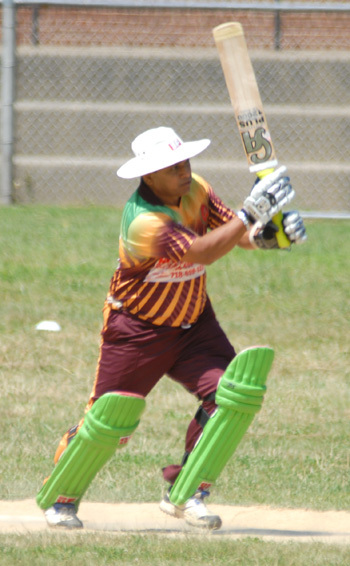 (Celebrating 35th Anniversary – Match #1080):- Cosmos scripted a comfortable victory on the steady shoulders of Debo Sankar over Pioneer at the Roy Sweeney Oval last Sunday after Pioneer posted a challenging 192 all out off the allotted 30 overs. The Oval pitch was surprisingly just a little damp and quite playable contrary to play being abandoned at other venues after days of steady rain. Pioneer got off to a good start with a 54 runs opening partnership after captain, Rako Halal won the toss and elected to bat. D. Sankar got the breakthrough when he trapped A. Ramnarain for 32 runs. D. Mohamed and Alex Chunilal combined for a good spell picking up six wickets between them as Cosmos kept the match in a balance. F. Berry got 94 while C. Bastian (15) had a few lusty blows before the Pioneer inning closed on 192 all out. D. Mohamed got 3 for 31, A. Chunilal 3 for 27. T. Rana 1 for 38, and S. Ali 1 for 22. It was Sankar who came to the fore for Cosmos with three good partnerships. He dug into his repertoire of strokes and a wealth of experience to produce a measured inning on a pitch that ‘asked a few questions’ and one that required some patience. He began the Cosmos inning first with young Alex Chunilal who gave a reasonable good account of himself in his first outing as an opening batsman getting to 13 runs with three crisply boundaries before he was lbw with the score on 17 runs. But Cosmos second-wicket pair of Royo Sankar, joined his younger brother, combined for the umpteen time in their outings at the wicket, laid the foundation with a committed 65 runs partnership before R. Sankar (35) drove loosely to point off Orlando Kirton, and two balls later, D. Chunilal attempted an injudicious pull and miss off a full length delivery, he didn’t trouble the score. At 90 for 3 in the 15th over, David Mohamed, the former Trinidad and Tobago national player, joined Sankar, and they began to nit together a solid partnership, Sankar found the extracover boundary with three cracking drives, while Mohamed accounted for two maximums over square leg and mid-off taking the total to 128 in 20th over at the break. On resumption, Sankar lounged into R. Tully, he cleared the mid-on and mid-off fence, then one bounce into extra cover and a pull to square leg boundary off the first four deliveries. He mis-timed a pull to midwicket in the next over and went for a solid 69 runs. Cosmos looked poised at 151 for 4 off 22 overs. Mohamed and Sohan Dass, the former Guyana national player, took the score to 167 before Mohamed (30) holed out at mid-off. Sham Ali and Dass took Cosmos to within 11 runs of the target before Ali (15) was run out off a poorly judged run between two seasoned players. The dependable Dass was still there, and he found the point boundary with a crisp square cut to ease the tension. Thohidhuzzaman Rana finished the match off in style with a thumping drive to the mid-on boundary to take Cosmos to 193 for 6 off 28.3 overs, and a comfortable 4-wicket victory. Cosmos will play Suburbia at Roy Wilkins Park next Sunday.